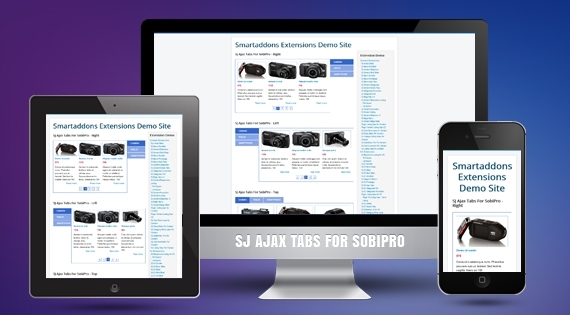 SJ Ajax Tabs for SobiPro is now available with Joomla 3.x. With criteria of easy-to-use and effective Joomla extension, SJ Ajax Tabs will play a considerable role in promoting website interface and help you meet your web traffic goal in a very quick way. With support of 4 tabs position, you can pick up the preferred one to show your items. Categories is shown up as tabs placed in Top, Right, Bottom, Left position. In addition, you can be able to use mousewheel to scroll side by side or mouseclick into navigation button to see referring items with high quality image, title, description, price and readmore link for each one. Moreover, image field can be shown flexibly by the number of options allow to get images from field Image, Description or External folder with ease of controlling image's width, height and background. You can easily enter the number of columns/rows and items to show on frontpage, add suitable categories, choose effect type, display/hide Title, description, Price and etc. All in this one module is meant to satisfy all customers' requirements of product showcasing. Let's access our demo to have the best look on this module!